Would you like to treat yourself or your loved ones to an experience they won’t soon forget? Need an idea for a bachelorette party, or a nice place with interesting entertainment for a birthday party or a private soirée? Come visit us at the Chefparade Cooking School, where we will fulfill your every desire. Spend a pleasant evening with friends or family, have fun cooking and preparing delicacies from all over the world and celebrate the occasion that has brought you together. What kind of private events do we offer? 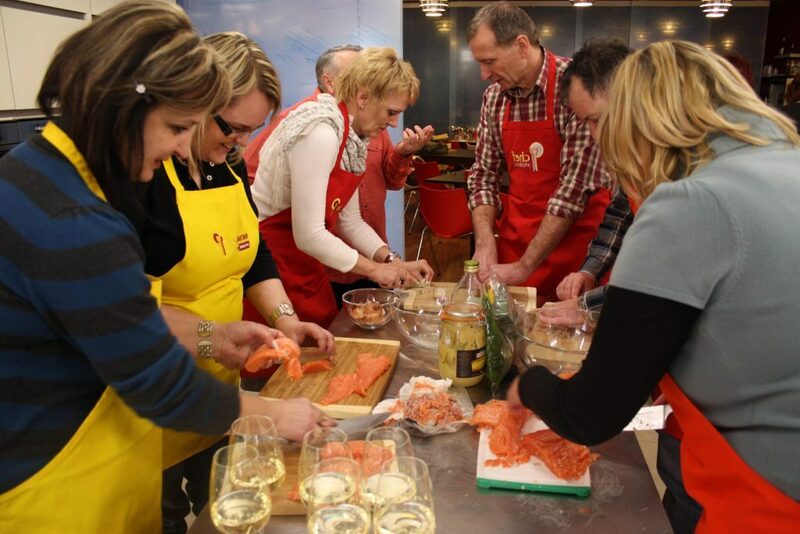 If you would like to give a special gift to that very demanding person or would just like the entire occasion to be exceptional, we can prepare an individual cooking class tailored to your wishes. If you need to learn something special, we can arrange to have the best instructor and expert from that field for you. 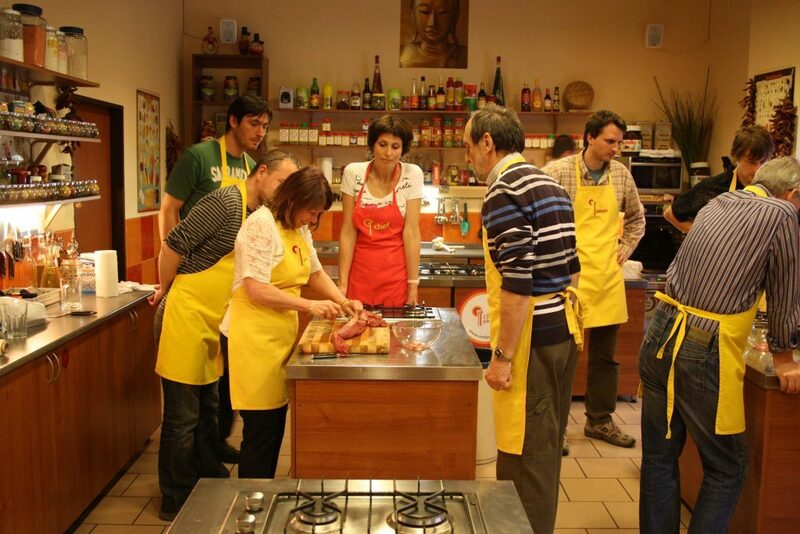 For an individual cooking class, you yourself can select the menu you want to cook. Find out all the details about such classes HERE. We make absolutely all arrangements for birthday parties, special events like bachelor’s parties, graduation parties, baby showers, gatherings to celebrate success in work or sports and other important moments of your lives. If you have an idea for something we haven’t done yet, let us know! We will be happy to make it happen. Sabina will be happy to give you more information on email address rezervace@chefparade.cz or on phone number +420 730 155 087. THANK YOU for submitting your enquiry /request /order. Private events and celebrations held at our studio can be prepared for 5 – 100 people, and generally take place on weekends. Our chef will first welcome you and give some cooking and safety instructions. You will then begin cooking the dishes that you selected in advance from our menu. You will prepare a total of 4 courses. All the ingredients you need will be ready for you in the studio. Upon request we can also prepare a welcome drink and additional entertainment in the form of games and contests. 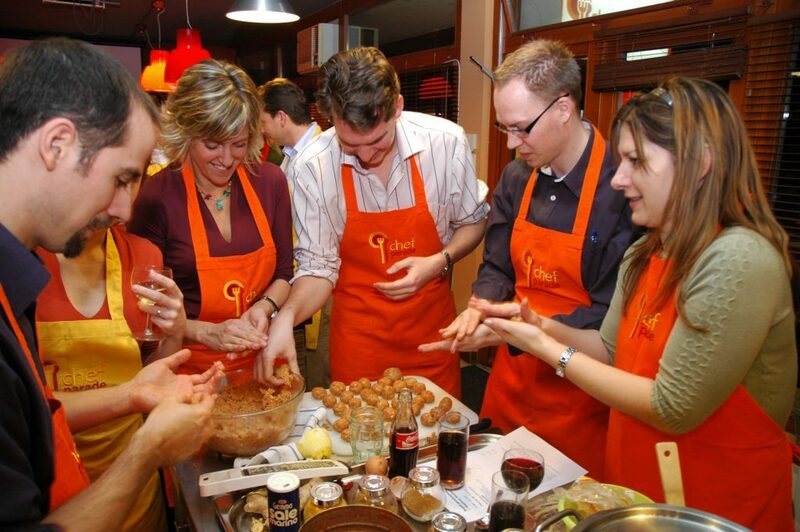 For a larger group of guests, you will be divided into smaller teams and each team will prepare a portion of the menu according to the recipes. You can look forward to a shared meal of the dishes you have prepared, a pleasant atmosphere and time to be together with friends or family. 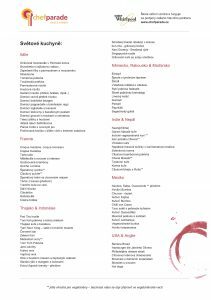 We have prepared a list for you of unique dishes from all over the world that you can peruse below. For private events we recommend a mix of international cuisines. You will put together a 4-course menu of your choosing, usually consisting of and appetizer, 2 main courses and a dessert. You will have the chance to prepare everything that you would never dare to try yourself at home. Before the event we will e-mail you a list of contests and games that can be played in the studio. 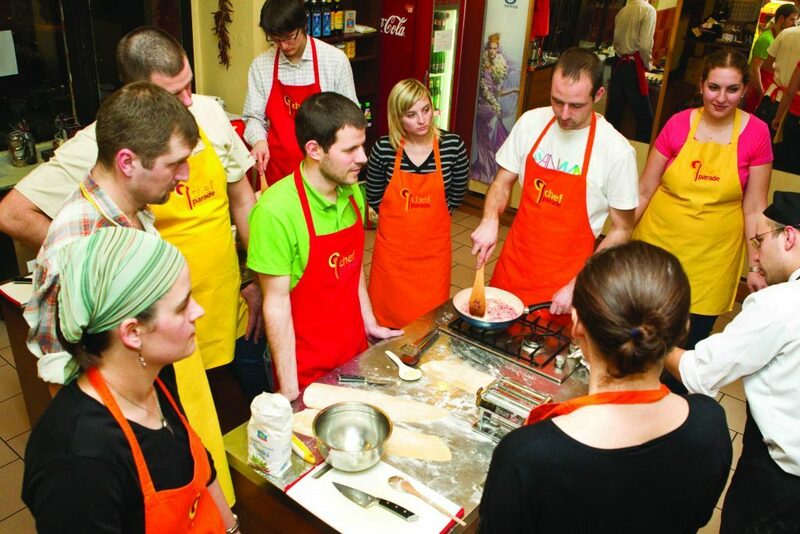 Each additional person over a group of 10 costs 1 690 CZK. Private events at our studio are held for 4 hours, if you would like to stay longer, studio rental will be added to the price of the celebration – 1,000 CZK for each additional hour. The hostess will help the chef make sure the event runs smoothly, take care of drinks and ensure the guests are comfortable throughout the evening. 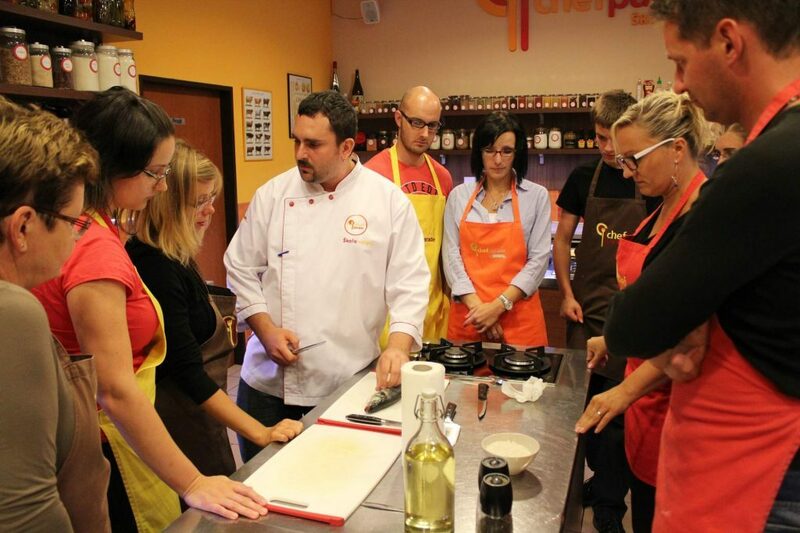 Chefparade in Holešovice has two state-of-the-art kitchen studios with a bar. The studios can be divided into two separate spaces or combined to create a large space measuring 450 m2 that can accommodate over 100 people. In the summer we would like to invite you to our terrace, where we barbecue and enjoy the beautiful weather. 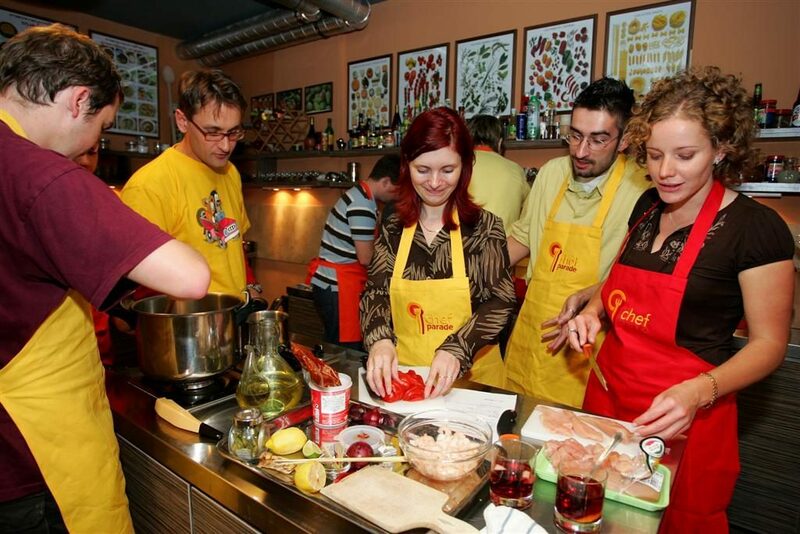 Chefparade in Žižkov – Husitská 56 has two cozy studios that make you feel right at home and can bring together any group! Both studios are suitable for 10 – 20 people or can be combined into one large space. To ensure an enjoyable experience for all, we have limited maximum capacity to 30.